NOW AVAILABLE FOR THE E39 M5/540i and Z8 - SPECIAL INTRODUCTORY PRICING. I installed the twin disc clutch in the BMW and it works great. The clutch is smooth and surprisingly can easily be slipped like a passenger clutch despite it having two solid friction plates. The clutch performed very well in the Enduro race with absolutely no issues. I'm very pleased. Keeping a working clutch in the powerful E39 M5 has been a problem since the car was first built. The initial design had a small clutch normally used for the 3-series tasked with harnessing the big M5's V8 torque. The result was frequent and expensive clutch replacements at the owners' expense. With the increased power levels of aftermarket tuner superchargers and turbochargers, this problem only became worse. UUC has a solution to this problem. By literally doubling the clutch surface area with twin clutch disks, there is now an option that has long-term durability, high power capacaity, and smooth-as-original operation. 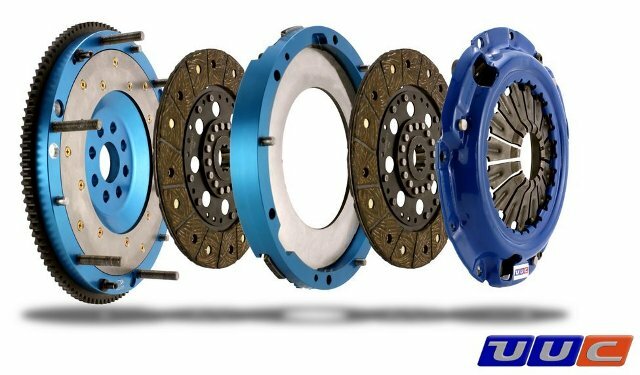 Unlike other race clutches that are noisy, clunky, heavy, or short-lived, the UUC Twin Disk package drives just like a normal clutch. It can be slipped smoothly in stop-and-go traffic and requires no more leg power on the clutch pedal than the original clutch. Packaged with a reduced-weight flywheel, a rotational mass savings will improve the car's acceleration and make it even easier to modulate clutch engagement with rpm. A noticeably quicker and livelier car is the result. Larger surface area of a smoother-functioning material is the key to combining the characteristics of high torque capacity with street-friendly operation in this all-new design. This unique design combines the stiffness of a steel cage with the reliability and compactness of a steel cover, and maintains normal pedal effort. Total package contains everything required: flywheel, clutch disks, aluminum cage, steel cover, release bearing, and all hardware.